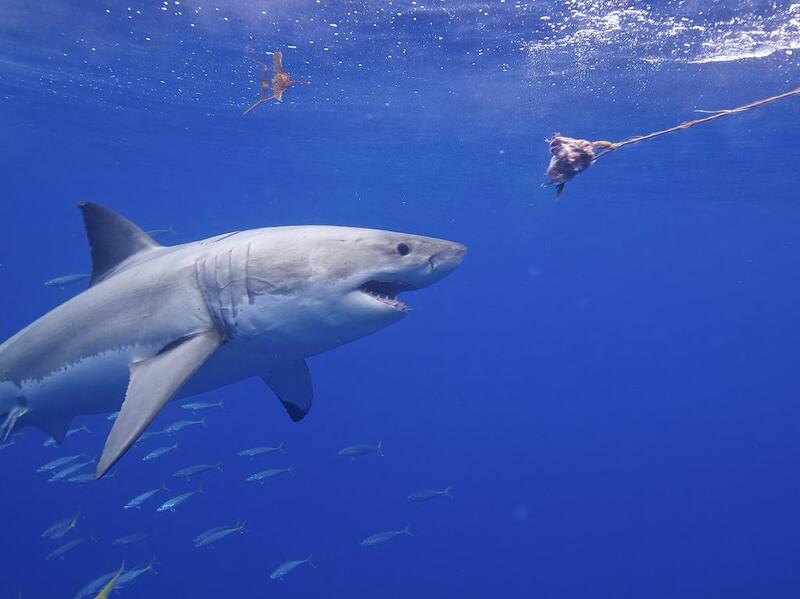 Great white sharks are magnificent animals and it is truly an honour to work with them. They are top predators and probably the most studied shark in South African waters to date. But one of the questions most often asked is: “how many of them are there?” Due to the lack of empirical data, the answer to this question is mostly based on gut feeling, belief and personal opinion. Because of this, authorities often fail to implement conservation measures in time. This is the reason why in 2009 world-renowned conservationist Michael (Mike) Rutzen, and myself decided to do the obvious thing: to simply start counting them. We undertook the data collection around the entire South African coastline. Considering that Dyer Island near Gansbaai – on the western coast of the country – is seen as the white shark’s capital of the world, we were expecting the population number to be quite high. Mike is a South African, well known from international documentaries like “The Sharkman”. In these documentaries, he free-dives with large species of sharks to dispel the myth that these beautiful creatures are human killing machines. Relying on his 20 years of experience with great white sharks, building the study and identification protocol for the counting was relatively easy. Once the protocol was established, we set sail for the most comprehensive project to date on South Africa’s white shark population. In and around Gansbaai we collected and, most importantly, analysed more than 5,000 photographs from which we could identify 426 individual white sharks by the unique notches of their dorsal fins. We then performed a capture-mark-recapture analysis to ensure that we were not double-counting the same individuals. This works by building a re-sighting table, or a history-of-recapture matrix, in which the presence of each individual shark at a given time is recorded. 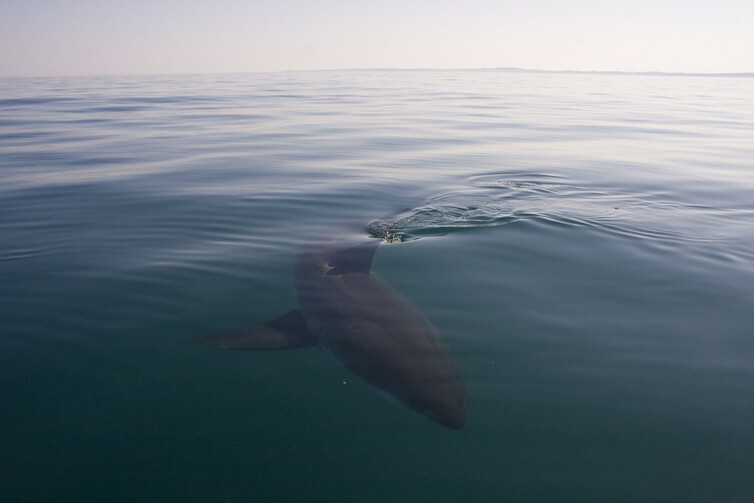 To our surprise, we struggled to find new individuals to photograph once 400 white shark individuals were identified. This means that most of the white sharks visiting Gansbaai were already in the database. The results from this part of the study indicate with 95% confidence a population estimate of between 353 and 522 individuals. This is 52% less than that estimated in previous mark-recapture studies. We needed to be sure that the white sharks we identified and counted in Gansbaai were representative of the entire white shark population along the South African coastline. So we set sail again and spent another four years sailing around the coastline collecting biopsy samples and photographs of dorsal fins. The subsequent genetic analysis, performed under the supervision of Professor Conrad Matthee, from the Evolutionary Genomic Group at Stellenbosch University, proved that there is only one interbreeding population and that the same sharks are roaming the entire coastline. Once we collected 303 genetic samples we took the analysis up another notch. With the genetic analysis we were able to estimate the population size and double check the results of the photographic identification work. The biopsy samples came from 233 different white sharks. Analyses of 14 microsatellite markers revealed a contemporary effective population size of 333 individuals. Genetic analysis is not the same as counting the sharks. With a genetic analysis we estimated the number of successful breeding individuals who generated the sampled population. The results can also be used to indicate the survival potential of a population. It has been indicated that a minimum of 500 breeding individuals are required to prevent inbreeding depression for a species. The results of our study paint a very gloomy picture, with an estimated 333 breeding white sharks, based on samples collected around the entire coastline, for the South African population. Even more troubling is the fact that the genetic estimate of 333 breeding white sharks does not reflect the current situation, as this is an estimate of how many sharks successfully bred one generation ago. When looking at the number of adults counted with the photo identification work, we can conclude that South Africa’s white sharks faced a rapid decline in the last generation. More concerning is that their numbers might already be too low to ensure their survival. Our non-invasive study is the first of its kind. 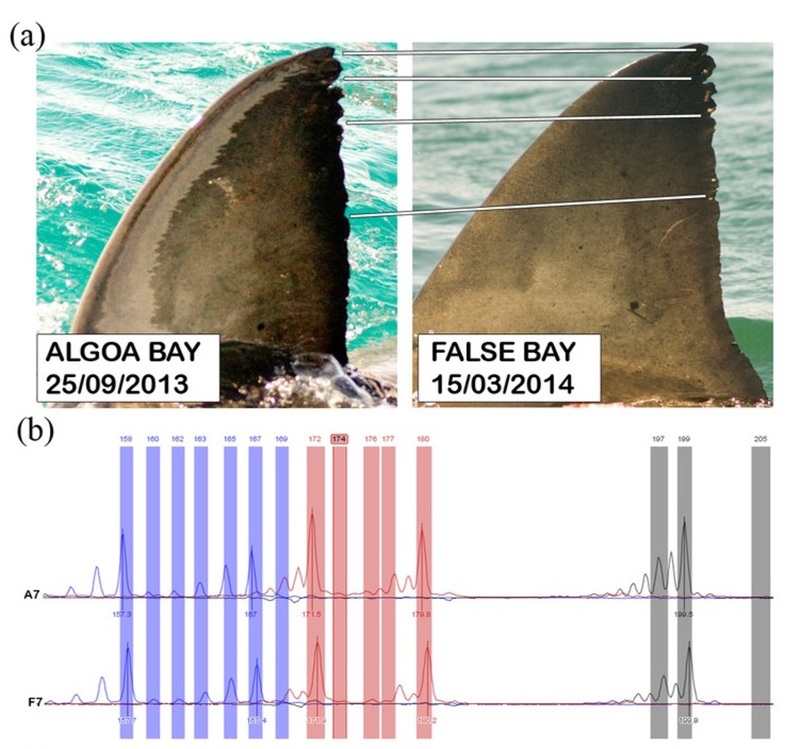 Not only did we sample known free-ranging white sharks, but we also built a database that links the genetic profile with the photographic identification of each individual shark. This combination of techniques provides a useful tool to double check the results of each technique. It results in a stronger and more reliable output. In the light of these results we should consider more drastic actions to ensure the long-term survival of this ancient species. But as white sharks can’t be bred in captivity or relocated, we can only protect their environment and food resources if we want to conserve them. In terms of legislation, making the regulation on their trade stricter could slow down the illegal trade in jaw trophies. Finally, in terms of immediate actions, we could halt the use of gill nets and baited hooks as shark-protection measures and hopefully move toward eco-friendly alternatives. Our hope is that from now on white sharks will be monitored more closely and that better conservation measures will be put in place. We also hope that delicate arguments, like the estimate of a vulnerable population, will be based on acceptable scientific methods rather than the personal opinions of well-meaning individuals.